The diploic channels are placed between the vault cortical layers (external and internal). The calvarial diploe contains large and valveless diploic veins interconnected through a complex network of microscopic channels. We have now published a procedure for segmentation of diploic channels and localization of the main vessel pathways by reducing the noise of the cancellous bone. We also provide quantitative description of the diploic vessel variation in modern humans and three Neanderthals. One modern human was reformatted at three different resolutions namely high, medium and low, to estimate the effect of the pixel resolution on the final anatomical rendering. The use of computed tomography at high resolution can hamper semi-automatic segmentation of the diploic channels. Optimal resolution should be sufficient to reveal the channels without increasing noise associated with the trabecular structure. We have found that modern humans present a remarkable variation of diploic channels in their morphological patterns, being the parietal area the most vascularized. There is a correlation in the degree of vascularization of the frontal, parietal, and occipital bone, and no asymmetries can be apparently detected. 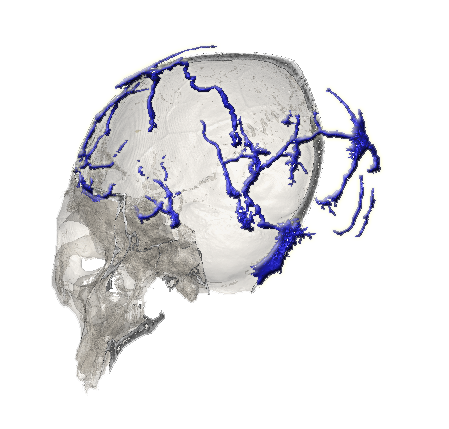 The three Neanderthals analyzed in the study also display a parietal vascular network, but less developed than modern human, suggesting these vessels may be involved in evolutionary changes. The diploic network is commonly connected with the meningeal artery at the temporal fossa, with the emissary veins at the occipital bone, and with the venous sinuses at the parieto-occipital areas. The brain and braincase of our specie are characterized by larger parietal areas, and changes in the vascular organization can be associated with thermoregulation and heat management. In this sense future research may help us to understand the possible involvement of the diploic veins in brain thermoregulation. The study of diploic channels may be relevant in anthropology, medicine, paleontology, and forensic sciences. 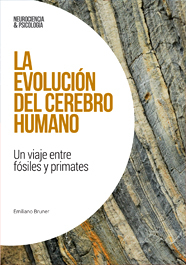 Bruner E., Amano H., de la Cuétara J.M. & Ogihara N.
on the midsagittal profile in adult humans.